The Benromach Distillery Company, has today announced the launch of one of their rarest expressions to date. Benromach 35 Years Old (43% ABV) was crafted and laid down to mature at the distillery in the 1980’s, before the Urquhart family, owners of leading whisky specialist Gordon & MacPhail, revived it in 1998. Handcrafted using the finest natural ingredients at the Forres distillery, and created under the watchful eye of former Distillery Manager Donald MacDonald, this latest rare release is said to exude the heritage of the Speyside distillery. Delivering notes of orange marmalade, kiwi, grapefruit aromas and cinnamon spice to the nose and notes of honey, fruitcake, ripe banana and melon to the palate, Benromach 35 Year Old, comes packaged in a bespoke decanter that is encased within a wooden presentation box, reflecting the various elements which have gone into making the whisky; the copper stills, the dark, grained wood of the original washbacks and the white of the limewashed distillery walls. Originally built in 1898, Benromach Distillery was brought back to life when leading whisky specialists Gordon & MacPhail purchased it in 1993. The distillery was extensively re-equipped over a five-year period before it was officially opened by HRH Prince Charles in 1998. In reopening Benromach Distillery, Gordon & MacPhail decided to create a classic Speyside single malt, a style that draws its influence from Speyside whiskies pre-1960s. 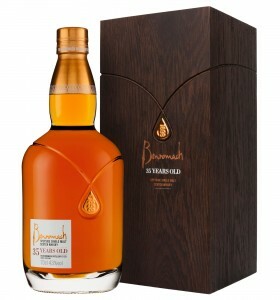 Benromach 35 Year Old, will be available later this month from specialist retailers for a RRP of £425.00.